Genre: Kart Racing. Other versions: X360; PC. From the moment you lay eyes on F1 Race Stars’ kitsch presentation and cheesy-grin zaniness, it seems almost inevitable that it’s going to divide opinion. Despite the obvious sporting connection, it’s fairest to think of it first and foremost as a kart racer, as comparisons with the heavier F1 sims, however tempting, aren’t really relevant. Regardless, the 2012 season had largely run its course by the time of the game’s release, suggesting that, with a partially out-dated roster of twenty F1 stars being rather incongruously accompanied by a quartet of cartoon-hero newcomers, that die-hards perhaps weren’t the target audience anyway. Eleven circuits make an assault on the senses, showcasing a penchant for plump, bubbly primary colours that borders on the aggressive, and as it is power-ups and speed-strips galore, Mario Kart remains the fairest yardstick by which Codemasters’ brave retail venture should be judged. The main sticking point is this; a lot of people have given F1RS a hard time because, well, it has given them a hard time. For many, kart racing evokes expectations of immediacy and accessibility, and despite the sunny, hyperactive cartoon veneer, F1RS is a tough game, and very unforgiving in the early phases. There’s no question, it can be immensely frustrating at times, and sometimes feels like races are decided more by opponents ganging-up on you than how well or badly you’ve driven. There’s issues surrounding the lax handling, lamentable collisions and smooth but rather disinteresting driving component (in part due to a rather meandering pace), whilst some power-ups, such as an unblockable raincloud that slows you for an inordinate period, should never have made it in to the game. But give it time, and you’ll find this racer is by no means a write-off. In this instance the power-ups, very much the driving force behind kart racers, are really very good indeed. Admittedly, it doesn’t deviate far from the Mario Kart blueprint; red homing bubbles rather than red shells, blue bubbles as opposed to banana skins, screen-blocking confetti instead of ink, as well as the usual repertoire of speed-boosts and ‘rocket through the field’ bonuses. Original they most certainly are not, but the important thing is, they work really well. There is the odd cool new ability – such as calling on a brief safety-car period in order to curb the charge of a runaway leader, which fits in really nicely, whilst each team has its own special move that tends to involve an enhanced version of a standard power up, or enhanced performance during a slipstream, going off-road or following a jump. So whilst a little more driver input wouldn’t have gone amiss, there are some real positives. Cars take damage from power-up hits, adding a dash of strategy in weighing-up whether to risk staying out or lose time pitting for repairs. Tracks conceal a host of hidden routes, whilst their compositions are eminently likeable; mixing facets of real circuits with easily-identifiable national traits. Brazil for instance sees you tackling the famed Senna ‘S’ before having to weave through a carnival and through a rainforest. Italy combines Monza’s characteristically long straights with coliseum surrounds, and Abu Dhabi features sandstorms, desert terrain and a rather wonderful rollercoaster-track at the beginning. And you’ll get to know the tracks well over the course of an impressively meaty Career mode, which comprises of a whopping thirty individual tournaments. You’ll be tested across a whole range of kart-racer disciplines, and credit where it’s due, there are very few duds here. As well as standard race and elimination formats, you’ve got the rather funky Refuel mode, which sees the player collecting fuel icons but running as light as possible so as to maintain high top-speed, and Slalom, which sees the player trying to drive through gates of matching colours so as to stack lots of points – it’s lively stuff. Indeed, there are times when it feels like F1 Race Stars is on to something really good, but troubles continue to put a leash on its potential. Time Trial mode sets you a sequence of times to beat in order to win medals. Provided you don’t literally get lost, you’ll likely attain a silver on your first flying lap, but whilst getting Golds is an extremely tough ask, the Leaderboards never recorded any of my lap times. The presentation gets the job done, and presents a nice change-up from the clinical veneer of most F1 titles (the wet weather effects in particular are gorgeous), though the music is clunky and carnival-esque and the obligatory driver-sounds rather underwhelming, even if the main theme is rather racy. It’s got a strong multiplayer setup, with a potent split-screen option that even lets friends race together in the Career mode. Racing Online is pretty intense and runs fine for the most part, save for a combination of lag and collisions (which are usually mutually disadvantageous) as typically if you’re jockeying in close quarters with a bunch of other racers, cars will be bounced around in a horrible, jarring fashion that’s more akin to pinball physics than racing. A little more incentive would have preferable to encourage long-term play, as there’s no real structure and achievements are afforded curiously little reference on your statistics page. But the point is, whilst it’s unforgiving nature and niggles make F1 Race Stars seem unpalatable to begin with, extended play reveals a challenging racer with neatly-designed tracks and a selection of power-ups and circuits that are, more often than not, on the money. More so, its smart two-player mode is likely to coax far greater replay value from the package than you would have thought possible in the beginning. 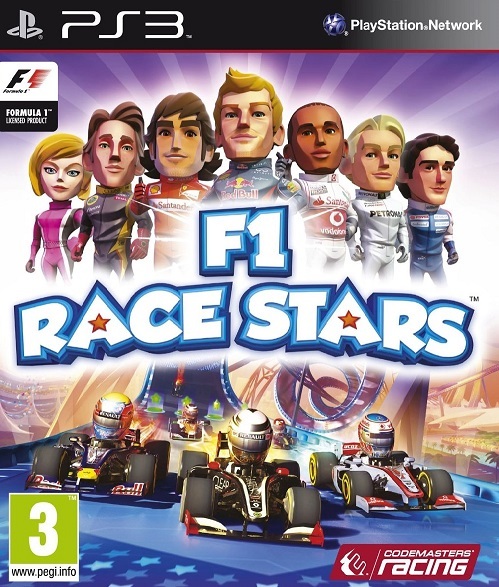 Those looking for a HD Mario Kart will have to wait a little longer I suspect, but if you like your karting games to pack a punch, then F1 Race Stars may prove an unlikely favourite.